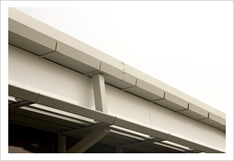 The most common type of steel gutters are found on commercial buildings. Because of its inherent strength steel is often used as large box style gutters to accommodate massive volumes of water coming off of large commercial roofing systems. Steel is also formed into half round gutter and occasionally K Style gutters. Because of the often custom nature of steel gutters the installation methods and hardware greatly vary. All manner of standard brackets and hanging systems covered in the gutter installation section are used on steel gutters as well. Including K Style, and Half Round Gutters. The primary difference comes in custom box gutter installation. Often metal fabrication shops will make custom brackets or hanging straps sold in tandem with the box gutter systems they produce. Also, the pre-engineered steel building industry makes dozens of different styles of standard box gutters to complement their building and roofing systems. Galvanized: The most common coating on steel gutters is a thin layer of zinc applied with electricity. This process creates what is known as a galvanized steel gutter. Painted: All manor of paint is applied to steel gutters the cheapest simply being homeowners or property managers painting the gutters when painting the building. Powder coating steel gutters with factory applied paint provides a higher durability finish that can last for decades. Kynar Coated: Kynar is a resin based highly weather resistant coating that is often applied to steel is nearly all forms including gutters. Kynar finishes will add a premium price to gutters but will also include greater warranty and excellent corrosion resistance. Some kynar finish warranties last 35 Years or more. Copper Cladded: If you like the look of copper but don’t necessarily want a thick or extremely expensive pure copper gutter one way to go is copper cladded stainless steel gutters. One advantage is the easy bending of copper cladded stainless. Also noted for there lightweight copper cladded stainless steel gutters offer beauty and durability.